(From left) Justin Passaportis, Adele McCarthy, David Hanus, Brian Negus and Tony Weber. Australia’s place in a world of innovative transport technologies and the concept of driverless vehicles was discussed during a policy networking event in Melbourne on Thursday. Organised by Roads Australia, ‘Driverless disruption – Bigger than Ben Hur’ saw a panel of industry professionals discuss the prospects of autonomous vehicles in Australia. The panel included: RACV public policy GM Brian Negus, Federal Chamber of Automotive Industries chief executive Tony Weber, Transurban GM technology partnerships and innovation David Hanus, Infrastructure Victoria strategy director Adele McCarthy and GoGet Car Share GM Victoria/South Australia Justin Passaportis. Presenting the welcome address, Roads Australia sustainability chapter chair Marko Misko underlined how Australia is yet to fully grasp the far-reaching impacts of vehicle automation on everyday life and how people work and where they live. Roads Australia says automated fleets will transform to both "complement and compete" with existing public transport systems. It also says that the use of such technologies will also "accelerate the erosion of our current road funding model". While many industries including transport, logistics and insurance are making efforts to evolve their business models to leverage new market opportunities, Roads Australia believes there are many more such opportunities that industries can make use of in the future. 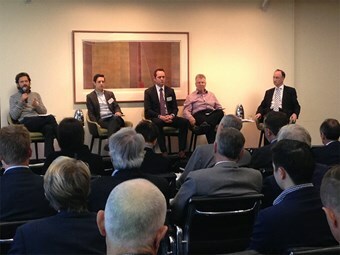 While discussing what the concept of autonomous vehicles meant to the freight industry, the panellists agreed that Australia’s unique conditions could pose many regulatory issues for the governments before such technologies are applied to domestic fleet. Hanus and McCarthy suggest that autonomous freight vehicles will bring about productivity improvements in the transport and supply chain industries. Negus says although it will be long before such technologies become a norm in cars and buses before adding, "it is going to happen but the Australian state governments are way behind in terms of reaching that point". He insists that authorities must "resolve ethical, liability and regulatory issues before we can apply these technologies" in Australia. "Government will have to set up regulatory framework that outlines liability guidelines to meet such demands." Concurring with Negus, McCarthy says that Australia is a "technology-taker" and people are going to "demand" such technologies and infrastructure in the future hence the government will have to take necessary steps to prepare for such disruptive technologies. "Driverless vehicles technology is just one of the many disruptive technologies of the future," McCarthy says. She says while it is not easy to trial 21st century technologies with 20th century infrastructure, the long-term freight improvements can be reason enough to make that effort. She also notes that it is important to trial such technologies on arterial roads before deeming them a success on Australian terrain. "In 30 years’ time, we will see some fundamental change in how these things work and the scale of this change will be absolutely huge," McCarthy says. Negus points out that a downside to autonomous technologies is that public transport infrastructure could come under increased pressure. This, he says, will require timely upgrades to meet new challenges. Hanus says both federal and state governments must ensure that we continuously improve road furniture such as signage and traffic lights to ensure Australian roads are well-equipped to handle innovative technologies. He says while it will not be an easy task "marrying these technologies with our existing infrastructure" it will be beneficial in the long run. Hanus agrees with the view that autonomous vehicle technology, albeit at least a decade away from becoming common in Australia, is definitely the future of road transport. He says in the future, the transport industry will see an increased number of smaller freight vehicles and fewer bigger vehicles on the roads. Misko and Hanus say there is risk that Australia could be left behind if timely efforts to adapt to such changing environments are not made. "There is a threat that the world will go ahead and Australia is left behind if we don’t find ways to adapt to these changes."